Some of you may have already heard about this (if you’re on Facebook), but I thought this little happening was too special not to share it again here. “I’m on my way back to see you. I’m excited, and smiling like a loon on the Tube. I felt a little guilty spying on his scribblings, but he made no effort to hide them so I do hope he didn’t mind. I’d love to see what Brooklyn-based artist Sophie Blackhall would do with this. Her ’Missed Connections’ prints transform ‘message-in-a bottle’ classifieds messages into whimsically beautiful illustrations. You were reading Catch-22 on the subway this morning. I have never seen such a beautiful profile. I wanted to say hi, but then you’d turn towards me and I wouldn’t be able to look at your profile anymore. You were so into your book, I don’t think you noticed me falling in love with you. But I thought I’d ask, just in case. Have you ever found a note, or stolen a snippet of a conversation, that turned your mood around, even for just a moment in time? 3. “Never forgotten or re-written “- perhaps this is the secret to immortality? 4. “The sound of your dreams” – are dreams part of our past? 5. 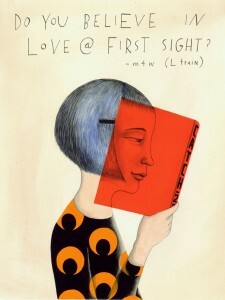 “Still young enough not to know the difference between infatuation and love” – goodness, I hope I never grow up then! oh i love glancing over peoples shoulders and having a nosy at what they’ve written. Sometimes you can find the most beautiful things that way. I love that whole Sophie Blackhall ‘missed connections’ idea – definately going to have to check out her work! I love this artwork…so original.